If a storm has damaged a few asphalt roof shingles, no need to fret -- asphalt roof repair is a relatively easy job to perform. The first thing to consider when performing a DIY asphalt roof repair is safety. A roof is a dangerous place to be. Never head up on your asphalt roof in wet or icy conditions. Ensure you have a safety harness and proper non-slip work boots. Secondly, ensure you have the necessary tools and materials for the job. 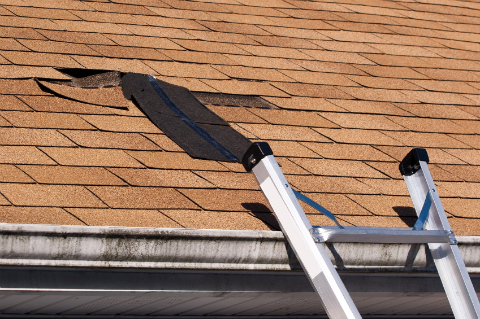 You will need replacement shingles that match your asphalt roof, a pry bar, a hammer, a screwdriver, a utility knife, a ladder, roofing nails and tar paper underlayment. Thirdly, make sure you have good weather before performing your asphalt roof repair. If you attempt to perform an asphalt roof repair job in the cold, the asphalt roof shingles will likely crack. In warmer weather, asphalt roof shingles are more malleable and easier to handle. Remove the nails and asphalt roofing shingles. The first course (layer) of asphalt roofing shingles are secured with four nails. Each subsequent course of asphalt roofing shingles will also be secured with nails from the course above. Your damaged shingle should have a total of 8 nails to be removed. Using your pry bar, carefully lift the damaged shingles up until the nails pop out. Lower the shingle, and use the pry bar to remove the nails. If the nails rip through the shingle, use the screwdriver to pry them out until you can manage to remove them with your pry bar. Remove the damaged shingles. Install new tarpaper underlayment. The underlayment will add an extra layer of protection against water leaks. Use your utility knife to cut the underlayment to size (large enough to cover the area underneath the course above your new shingles, and to extend to their bottom edge.) Slide it underneath the existing underlayment as far as you can in the area where you will install the new shingles. Install your new asphalt roof shingles. Line up your new shingles, and hammer them in place. Asphalt Roof Repair: DIY or Professional? Asphalt roof repair is one of the simplest roof repair projects. However, as mentioned, roofing is a dangerous job. The risk of falling or injury is high, especially for those unfamiliar with the workplace. An improperly executed roof repair is also more trouble than it is worth. The cost of water leaks is not worth the money saved from a quick fix. It may also negate any warranty attached to your asphalt roof, so it is prudent to consult with your insurance company first. If you do decide to contract a professional roofer, HomeAdvancement can connect you with asphalt roof repair experts in your area.